XS-PC has been making bay reservoirs for a while now, and people have been wondering when will XS-PC come out with a tube reservoir. Well the wait is finally over, let me introduce you to the XS-PC Photon series of reservoirs. The reservoirs come in 2 sizes, a 170mm option with a retail price of $54.99, and a 270mm option with a retail price of $64.99. If you are wondering why it took XS-PC this long to come up with a tube reservoir, well, the answer is that XS-PC put a lot of design effort into it. The reservoir is made from crystal clear solid glass, with machined aluminum brackets to help you mount this beautiful reservoir in your system. XS-PC came up with a new mounting technique with the Photon reservoirs, the Acetal end caps are held in place by the aluminum brackets, this way there are no ugly plastic mounts visible in your build. The center of the reservoir has an acrylic lighting pole that connects to an included white 5mm LED at the base of the reservoir. The LED is easily replaceable so if you wanted to match the color on your build you can easily do that with a 5mm LED. The Photon series reservoirs some with three G1/4″ ports to allow for multiple configurations, and fluid capacity of 690ml. The Photon 170 holds 410ml of fluid, and has the same three G1/4″ ports. Each Photon reservoir comes with a 5mm white LED, and a single G1/4″ plug and screw set. Thanks to its all glass construction, the Photon reservoirs weigh more than their acrylic counterparts. First look at the Photon reservoir and you notice the beautiful crystal clear, high quality glass tube surrounded by Acetal end caps. Also to notice is the thickness of the reservoir. 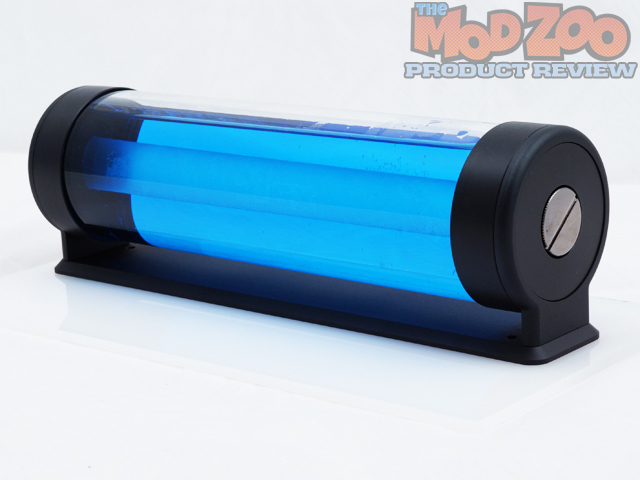 At 3″ or 75mm wide, the Photon is a good 15mm/.5″ wider than your average tube reservoir. The acrylic rod in the middle has the XS-PC logo printed on it. The included 5mm LED can be used to illuminate the rod in the middle. The Photon 270 comes with 4 screws for mounting the reservoir to your case. Also included is a 5mm white LED and an LED O-ring to help secure the LED to the bottom LED port. The bottom end of the Photon reservoir has three G1/4″ ports and a single 5mm LED port. XS-PC includes a single G1/4″ plug in case you don’t need the third port. Here is how the bottom side of the reservoir looks with couple fittings installed, along with the included 5mm LED. The top end of the reservoir has a single G3/8″ port, that is intended to be used as a fill port. There is handful of G3/8″ fittings out there if anyone wanted to use one, or you could also get a G3/8″ to G1/4″ plug to use your existing fittings. Both the end caps of the reservoir have a built in anti vortex feature, this helps in keeping the flow of water calm in the reservoir, and you don’t see a fountain getting shot inside the reservoir. Here is another shot of the included accessories and the mounting bracket that come with the Photon reservoir. The reservoir mounting brackets are held in place by 2 screws on each side, Once you take the screws off you can separate the mounting bracket and the mounting plate. Here is another look a the mounting bracket and the mounting plate. Pictured above are the 2 Photon reservoirs next to each other, on the left is the Photon 170, and on the right is the Photon 270. Thanks to the crystal clear glass, the color just pops out in the reservoir. Also, the fact that there are no ugly plastic clamps holding the reservoir, the view looks even better. I had some Mayhem’s Red dye, and I decided to try that out as well. I was honestly surprised by how nice the color popped out thanks to the glass tube. The frosted acrylic rod in the middle creates a nice effect even when there is no LED installed yet. Here is shot of the Photon 270 with Mayhem’s Red. No LED is being used, and still the rod in the middle creates a nice contrasting effect. I decided to play with some LED strips to simulate lighting in the case, and the results were just awesome. The reflective properties of glass create some amazing patterns and effects. The back of the mounting panel is flat, and travels from one end of the reservoir to the other. This ensures proper weight distribution of the reservoir and fluid. To install the included 5mm LED, all you have to do is put in the LED O-ring into the LED hole and just slide the LED in. The O-ring makes sure that the LED does not fall out. I decided to compare the Photon to a Bitspower tube reservoir that I had. The difference in the bigger size of the Photon can be seen easily. This might be an issue for people who want to use a tube reservoir in a small build with tight spaces. The Photon series of tube reservoirs scream quality from the minute you take them out of the box, to the moment you install one in your build. The all GLASS tube of the Photon reservoirs is simply beautiful, and the aluminum mounting brackets just add more to the high class look and feel of the Photon reservoir. There is nothing out there that can match the Photon quality at the given price of $54.99 for the Photon 170, and $64.99 for the Photon 270. The 270 edition is the perfect reservoir for anyone working on a large build using a case like the Corsair 900D or any of the Case Labs offerings. The huge size of the reservoir makes it a perfect candidate for those huge and beautiful builds. And, if you are working on a small build, the Photon 170 is a great candidate for the job. Comparing it to the average tube reservoir that you get for the same price, the Photon is a clear winner. XS-PC took its time to come out with a great product, and just like the AX series, they have created a new breed of high quality and affordable reservoirs. Lack of G1/4″ ports on both ends. Would like to see a brighter LED included in the package. The first mod that I will be doing to this thing is putting some G 1/4″ ports on the top side. You can create some unique looks for the reservoir by painting the mounting bracket a different color, like white. You could also engrave your own logo or build name on the frosted acrylic. Other than that there is not much you can do to a reservoir in terms of modding. Given the price and the quality of this reservoir, there is nothing I can do but give it a perfect score. I applaud XS-PCs effort to come with a great product in the water cooling market. I would love to see XS-PC fix some of the cons that I pointed out, like the lack of G1/4″ plugs on the top end. Really great reservoir. I’m thinking to buy one for the next build. Thanks for another great review Jesse. Don’t suppose you have a picture of a pump hooked up so we could see the anti-vortex/fountain in action? I love that Pyrex is getting more common. Gimmie the glass, a set of O-rings, and access to a cnc lathe. Well, I thought I knew what res I was going to use in my next build, but now I may have to reconsider. That res looks fantastic, and very clean. Very nicely done, XS-PC…Thanks for another great review Jesse. Don’t suppose you have a picture of a pump hooked up so we could see the anti-vortex/fountain in action? Shot a little video clip of the res in action last night. Let me know if you would like to see a different angle. Thanks mate and welcome to the zoo. I will once i get something to mount this sucker in a vertical manner. Thanks mate, glad you approve. Great review Jesse, res looks tight, might just get this. So you have that mounted in your XPS 720 case…sweet. I am also saving the drive shelf space for liquid cooling equipment. I am following along with you build in the logs. Thanks for showing the res. Your welcome mate, I’m going to redesign some of my build and make some changes. The mobo and the CPU are no longer available to me. Obviously these reservoirs & the ones with the integrated pumps would look & work better if they’re mounted vertically, but if the 170mm reservoir w/o pump doesn’t fit at rear of Phanteks Enthoo Luxe case, maybe the longer tank will fit horizontally on top of psu-cover. Any planning to do this? Does anyone know the internal-diam. of the acrylic-tube as I wouldn’t mind seeing if I could mod it to take a length of colour-change LED-strip so it will change with the case-lighting that’s already in the Luxe?